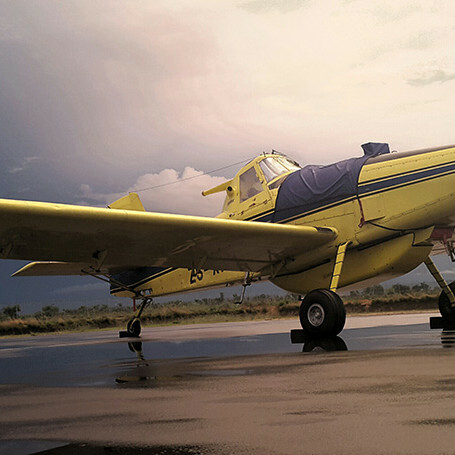 Xcalibur’s aircraft of choice is the Air Tractor AT-502B (AT5T) fitted with the time proven Pratt & Whitney PT6-34 engine. This rugged aircraft and reliable engine combination greatly enhances safety. The Air Tractor is the most successful aerial application aircraft ever built. Designed for ease of operation and maneuverability at heights of 3 meters above the ground during crop dusting operation it easily handles the more relaxed heights required for aerial surveys. Incorporated into its design, the Air Tractor possesses superior handling characteristics and easily copes with the varied weather conditions imposed on this survey platform during turbulent and windy conditions often experienced during low level surveys. The Air Tractor’s robust landing gear makes it suitable for operations on rough airstrips in remote areas. All our aircraft are certified by the South African Civil Aviation Authority in compliance with the requirements of FAR23. The Air Tractor has a built in safety cage around the cockpit and was also the first to incorporate airbags built into the 5 point pilot restraint harness. From an aviation safety point of view this greatly enhances pilot survival rate in the unlikely event of an accident. We only use our own SA CAA approved Aircraft Maintenance Organization (AMO 1301) based at Wonderboom Airport, Pretoria to ensure that safety monitoring has full transparency during the maintenance processes. Our pilot appointments are strict and the requirements are high. Xcalibur only employ full time pilots with high flight time on tail dragger type aircraft and extensive experience in ultra-low level operations. Xcalibur is a proud member of the International Airborne Geophysics Safety Association. Beside normal annual audits conducted by SA CAA and bi-annual safety audits conducted by IAGSA, Xcalibur has passed countless external safety audits conducted by globally known Aviation Safety Advisors like SGS Hart Aviation, and Litson and Associates.